Hi and welcome to Over the Moon. This month I’m joining in on a month-long blogging project created by The Nester, you can find the rest of the participants at 31 Days. 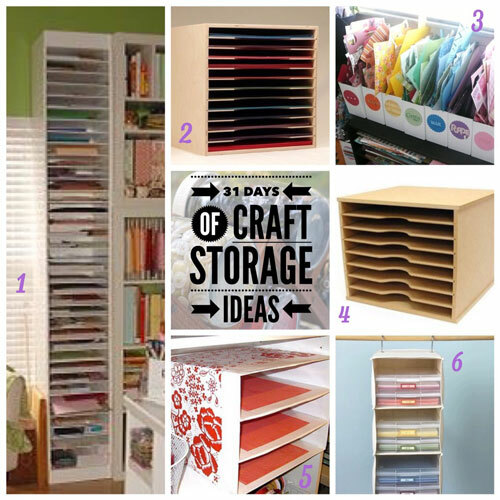 This is day two of 31 days of Craft Storage Ideas. Storage is at a premium in our little cottage and unfortunately I don’t have a craft space of my own. One day, I’ll turn one of the bedrooms into my studio. Today we are looking at storing craft paper, particularly scrapbook paper which is a bear to store as it is usually 12 inches square. Personally, I don’t have a huge stash of scrapbook paper, I moved on from that craft when my kids got older. but, I still have quite a few lovely pieces of paper that I would like to keep and use someday. Here are some clever ideas I’ve found to store a small collection and one really useful one for larger stashes. DIY a storage shelf that looks like it belongs in your local scrapbook store by the Husband and Wife team at Sew Woodsy. this one includes some great step by step photos. We all love IKEA, right? Theres nothing like the Expedit/Kallax units for organizing just about anything. Try this custom insert for the Expedit/Kallax. It inserts right into the compartments. IKEA must have been thinking of scrapbookers when they made them 12inches square! Store your paper scraps in magazine files just like Rachel from I Love my Three Sons. You could also make them larger to fit full size sheets of scrapbook paper. I’ve seen these at the local stationers but Darcy from Smart-Bottom Enterprises has made her own from shipping boxes. I don’t know about you but I always seem to have some of these sweater shelves that fit inside your wardrobe floating around, unused. If your craft area is in a spare room with a built-in keep your paper supplies in this. Here’s a bonus re-purposing project for you. 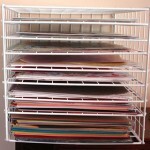 Convert a wire storage rack into useful paper storage using this DIY from Cat’s Creations. All you need is the wire storage grids (you might have some of these already), some cable ties and heavy duty scissors. If you’ve found other ideas for paper storage let me know in the comments or by using the contact link at the top of the page. I understand storing yarns is a real problem for me too. I recently discovered a yarn I really love and simply MUST have it in every colour, lol. Now I need more places to store it!